On Monday, the SF Mechanics faced off against the Tennessee Tempo. The Tempo have 2 GMs on their roster (Jaan Ehlvest and Alex Shabalov), but I guess neither one was available for this match, and as a result, the Tempo lineup had a much lower average rating than normal. Still, the games aren’t played on paper, and even though we outrated them by almost 150 USCF points at the moment, it was not an easy match. My own game was the first to finish. I had the black pieces against FM Todd Andrews, who I last faced in the 2008 USCL season (see the post and my annotations here). In that one, Andrews played 1.d4 and the game went into a Semi-Slav. This time around, he played 1.e4, and the game plodded along the normal Closed Lopez lines. The full game can be seen here. I just played 19…Bc8-d7, developing the bishop and guarding the potentially weak b5-pawn. At this point, White should really be trying to claim some squares. 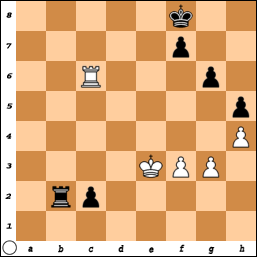 White played 20.Ng4?, which in a way is already the decisive mistake. 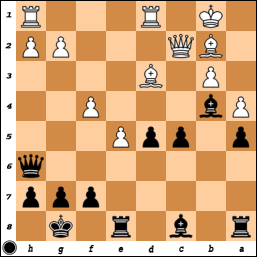 Strange to say that, but after 20…Qh4!, Black is threatening 21…f5 (now the h6-square is under Black’s control). 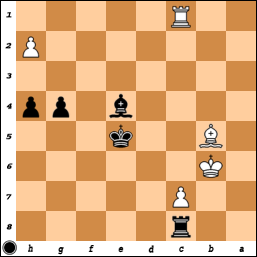 The game continued 21.Ne3 c4!, with a clear advantage to Black. It’s a bit odd to have a c4-b5-a4 pawn structure, but Black has now staked out serious territory on the queenside. The knights and Bc2 are stuck preventing …f5, but this leaves the rest of White’s queenside without any prospects. White tried 22.Qf3 Nc5, but felt that he had to play 23.a3, irrevocably weakening the b3-square. I was planning to play …a3 myself if given the chance, since after 24.bxa3, White’s queenside both weak and immobilized. The bishop on c1 can’t move anywhere good without losing the a3-pawn (and the rest of his queenside would be very weak). Thus, Black has a free hand to play …Nb6-c8-e7, supporting the …f5 advance. Instead of 20.Ng4, White had to play 20.b3, taking the c4-square and some queenside space before it’s too late. After 20…axb3 21.axb3, Black has the a-file, but it’s not especially amazing at the moment. Meanwhile …c4 can be met with b4, keeping Black’s knights from any nice central squares. The game after 20.Ng4 Qh4! 21.Ne3 c4 didn’t go particularly well for White, as he was powerless to stop …f5. I slowly built up the advance and diverted all my pieces to the kingside, and once that side of the board was opened, the curtain fell pretty quickly. As for the other games, on board 3, Danya was pretty much always a bit better, but not quite enough to win the game. On board 4, though, we thought we had a good matchup. However, David Justice took out the higher-rated Yian Liou in a pretty solid effort to bring things to a tie at 1.5 points apiece. White just played 33.Nc6-b4, aiming for the hole on d5. 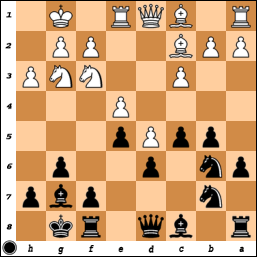 After 33…Re5 34.Nd5, Black blundered with 34…Qc5?. Wolff quickly responded with 35.Rxg6+! fxg6 36.Nf6+, forking king and rook. After 37.Nxd7, White was forking queen and rook to go up an exchange! Wolff finished the game off to take us to a 2.5 – 1.5 match victory. Special thanks to Payam for bringing drinks and pastries to the match for us! After watching the NJ Knockouts sweep a powerful Boston team with the help of some donuts, I figure we could do worse than to copy them. After our loss to Arizona in Week 7, we fell into a 3-way tie for second place in the division with Arizona and Miami. In Week 8, we faced the Queens (NY) Pioneers. On paper, the Pioneers look like they should have a solid team, but for whatever reason, they don’t seem to have performed up to those expectations. Here’s a somewhat late summary of that match. Black has just played 19…Qxe7xd6. White’s advantage is pretty minimal, but I think there is some advantage due to the difference in the power of the light-squared bishops. Black’s pawn on c6 cuts down his own bishop, and while White’s e4-pawn does the same, White’s e4-pawn can more easily move forward. If Black plays …c5, then the b5-pawn will drop. Thus, White should watch out for …c5 tricks from Black. With this in mind, both 20.f4 and 20.Rad1 are pretty normal looking moves. Pushing the f-pawn prepares 21.e4-e5, while 20.Rad1 brings a piece to the center and threatens a discovery against Black’s queen. The rook move would have maintained a small plus. 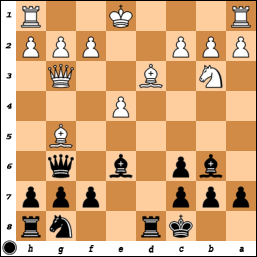 I didn’t spend much time here though and quickly played 20.f4?, failing to notice Black’s strong response 20…c5!. Stripunsky has played these sorts of positions a lot, and he wasn’t so quick to miss that resource. After 21.e5 Qb6, Black is threatening 22…c4+ and 23…cxd3, so White can’t simply take on f6. After 22.Rf2 c4 23.Bf5 Nd5, White can’t safely take on h7 because after 24.Bxh7+ Kh8 25.Be4 Ne3 26.Qb1 Red8, White has huge problems with his back rank and pieces. Black’s already clearly better. However, in mutual time pressure, Stripunsky made a couple mistakes to give me a chance to get back into the game. Black has just played 29…Ng2-e3, hitting the queen. I quickly played 30.Bc6? 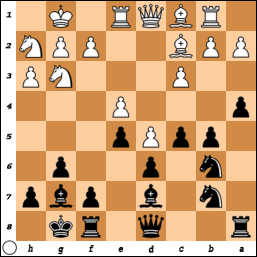 ?, failing to notice that after 30…Rxd6 31.Qxd6, Black can just play 31…Qxc6, since 32.Qxe7 walks into 32…Qh1 mate! Oops. (2) 30…Rxd6 31.Qxd6, and now 31…Qxb5 doesn’t threaten mate, so Black has to play 31…Qxd6 32.exd6 Re6 33.d7, when again White is doing just fine. Luckily, my mistakes in this game didn’t come back to hurt the team, as they all won their games. IM John Donaldson, FM Daniel Naroditsky, and NM Greg Young all won on boards 2 through 4. There was one interesting endgame moment in the game between IMs Lev Milman and John Donaldson on board 2. Both players were in time pressure, and had been for some time, when White played 40.g4? here. The endgame was about equal when it started, but Lev seemed to be pushing too hard and found himself headed towards a worse endgame. However, John mistakenly traded down into a drawn rook and pawn endgame to bring the correct result back into drawish territory. The endgame should be a draw – one idea for White would to play 40.Kd3 here. If Black plays 40…Rb3+, then 41.Ke2 guards the f3-pawn and leaves the c2-pawn undefended. Black’s best chance would be to play 40…c1/Q 41.Rxc1 Rg2, but then 43.Ke3 Rxg3 44.Kf2 Rh3 45.Rc4 Rh2+ (otherwise Kg2 traps the rook) 46.Kg3 is a simple draw. Black’s extra pawn can’t be realized here. Another way to try and draw this would be to play g4, trade the g4-pawn for the h5-pawn, and then go after the c2-pawn, sacrificing the f3- and h4-pawns in the process. The resulting rook endgame with extra f- and h-pawns is a theoretical draw, but given the time constraints, could easily swing Black’s way. Lev seemed to start out on this path with 40.g4, but Black has a trick here to make sure that never comes to pass. He can play 40…g5! !, forcing the creation of a passed pawn, no matter what pawn White takes. After 41.gxh5 gxh4, the point is that White’s king can never cross onto the 2nd rank because of …c1Q with check. Meanwhile, the rook is tied to the c-file. White can play 42.h6, but then 43…Kg8 stops the pawn dead in its tracks. After 44.Kf4 h3 45.Kg3 h2, one of the two pawns will queen. Unfortunately, John missed this nice finish and played 40…Ke7. Trading on h5 seems safest here, but Lev played 41.Kd3. This doesn’t throw the draw away, as after 41…Rb3+, White should play 42.Kxc2 Rxf3 43.gxh5 with a theoretical draw. Unfortunately for Queens, though, Lev played 42.Ke4, but after 42…Rb4+ and 43…hxg4, Black had two connected pawns to none on the kingside. John duly won that endgame and we were headed to our first match win since week 4. After 4 rounds, I had used up 3 of my whites (with 3 draws) and was sitting on 2.5/4, half a point behind the leaders. In round 5, I was black against IM Gergely Antal (2487 FIDE). Antal had been on a roll coming into the event, winning the national Collegiate Championship and then the strong Southwest Open prior to this event. He was also tied for the lead at that point, with 3 wins and 1 loss from 4 games. The opening was a Scotch with 6.Qf3 (that is, 1.e4 e5 2.Nf3 Nc6 3.d4 exd4 4.Nxd4 Bc5 5.Nxc6 Qf6 6.Qf3), and while I didn’t play the theoretically most-approved solution with …bxc6, I did get a reasonable position. 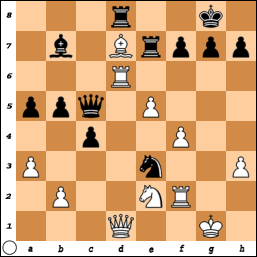 However, 11.Bg5 saw Antal take one liberty too many with his development and he quickly paid for it. After 11…Nf6, Black is threatening to take on e4, so he played 12.f3. If 12.e5 instead, then 12…Ne4 hits the queen and bishop. After 12.f3, though, I have 12…Nh5 when 13.Qh4 is forced (not 13.Qe5 Rde8, when White is powerless to stop a discovery on the e-file or the fork with …f6). After 13…f6 14.Bd2 (14.g4 fxg5 15.Qxh5 Qf3 16.0-0-0 Qxf3 is no fun for White either) Qxg2, White is down a pawn without any compensation. To add insult to injury, he can’t even guard the f3-pawn with 15.Rf1 because of 15…Qh3!. 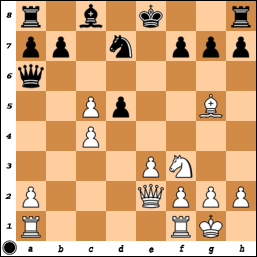 White’s queen is trapped, so he has to exchange queens, but then after 16.Qxh3 Bxh3 17.Rh1 Bg2, the rook is trapped as well! 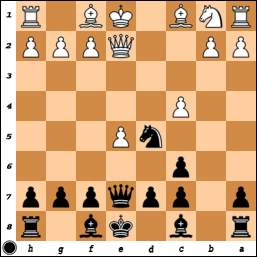 Note that Black’s bishop on b6 covers the g1- and f2-squares here. Thus, he played 15.0-0-0, but then 15…Qxf3 left me with two extra pawns, after which I had no troubles winning. So now I had 3.5/5 (or +2), with both wins coming as black. In round 6, I was white against the Brazilian GM (and current champion) Andre Diamant (2526 FIDE). Diamant was having a rough go of it in his first US tournament, but I couldn’t take him lightly. He surprised me by switching away from his King’s Indian Defense, instead opting for a Queen’s Gambit Accepted. I thought I was better after the opening, and then prepared to play d4-d5 in the following position with Qd1-c1 and Rf1-d1. I decided to push the d-pawn here with 14.d5. Now if he had played 14…exd5, I would have continued with 15.Nxd5 Nxd5 16.Rxd5 Qe8 17.Rxd8+. After either recapture on d8, White will play 18.Qc3 with some advantage. White is better developed and Black’s king is more likely to be attacked. However, he surprised me with 14…Nxd5. I can transpose into the above variation with 15.Nxd5 exd5 16.Rxd5, but I thought I could take advantage of his move order with 15.Ba4! ?, pinning the Nc6 and leaving the Nd5 pinned. White is hoping to play Nd4xc6 at some point, followed by Nxd5 and Bxc6. In any case, if White can play Nd4xc6, Black’s king’s shelter will be ripped open, which is easily worth a pawn. He hadn’t see 15.Ba4 at all, but luckily for him, it just barely works for Black! After 15…Be7, White has some trouble actually playing 16.Nd4 because of 16…Nxc3! 17.Nxc6+ Qxc6! (this is why 15…Be7 is important – the rook on d8 is now protected!) 18.Bxc6 Ne2+!, forking White’s king and queen! 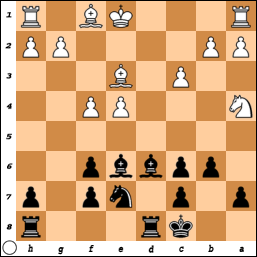 I played 16.Nf4 instead, but after 16…h3 17.Ncxd5 exd5 18.Rxd5 Qe8, Black was barely hanging on. The game later ended in a draw where both of us had to accept a repetition or end up much worse. Back in December, Danny had played 14.Be2, but after 14…f5 15.e5 Nd5 16.Bd2 Be7 17.b3, I could have equalized with 17…f6!. This motivated his search for something better, but in general, this endgame is just equal because while Black’s pawns look funny, they do control some key squares. Meanwhile, White’s knight on a4 is a pain to bring back to the game and White is behind in development. After 14.Kf2, the game continued: 14…c5 (threatening 15…Bd7) 15.c4 (allowing the knight to return, but giving Black the d4-square) Nc6 16.Nc3 f5 17.e5 Bf8 (avoiding e7 because of White’s next move) 18.Nd5 Nd4!. 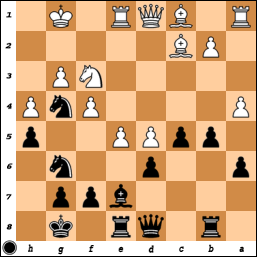 Black shouldn’t play 18…Bxd5 19.cxd5 Rxd5 20.Bc4 Rd7 21.e6, which was Danny’s preparation. However, after 18…Nd4, he was on his own and quickly realized that he didn’t really have any advantage. The game was agreed drawn in about 5 more moves. With 4.5/7, I was white against GM Eugene Perelshteyn in round 8. Both of us were on 4.5, trailing the leader, Ben Finegold, by a point. I would have liked to fight, but Eugene was well-prepared, and by essaying a sideline of the Ragozin Defense that IM Kuljasevic played against me in round 1, he caught me off guard. I didn’t react particularly well and decided to agree to a draw after only 16 moves. In the same round, Finegold had a quick draw with GM Diamant to get to the magic mark of 6 points, enough to secure his last GM norm. Meanwhile, IM Robson won to join Eugene and myself in joint 2nd place with 5 points. Thus, going into the last round, there was a chance for a 4-way tie for first. GM Perelshteyn had white against IM Finegold (which Perelshteyn ended up winning); I had black against IM Ippolito; and IM Robson was black against FM Rensch (a game which ended in a draw). With first place potentially on the line, and an interesting position to play (where I thought was at least ok, and maybe even a bit better), I decided to continue with 14…0-0 15.b4 Rac8. After 16.Qb3, I played 16…Ne5!. The tempting 16…Ne4 doesn’t really do anything, as after 17.Bb2 Rxf3 18.Bxf3 Nd2 19.Qd1, Black has only succeeded in exchanging some pieces. Instead, after 16…Ne5!, Black is threatening to meet 17.Bb2 with 17…Nc4, when the other knight will join its colleague in the center with 18…Ne4 with advantage. 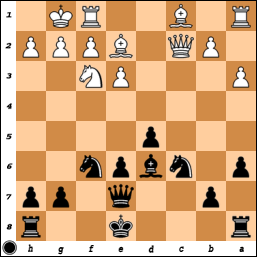 Thus, Dean played 17.Nxe5 Bxe5 18.Bb2, but then I played 18…Qd6!. It’s important to try and claim the a1-h8 diagonal, and if the bishops get exchanged on e5, Black’s queen is beautifully centralized on e5. Dean reacted poorly with 19.f4? (both 19.Bxe5 and 19.g3 were better, although I think 19.g3 was really the best move by far). After 19…Bxb2 20.Qxb2 Qb6 21.Qe5 Ne4 22.Qd4 Qxd4 23.exd4, Dean surprisingly thought he could hold this endgame. However, after 23…g6! 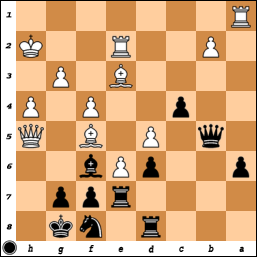 (putting an end to ideas of Bg4 and f5), Black is in total control. White has a number of weak pawns and squares, and it is only a matter of time before Black wins. After about 10 moves, we reached the above position. Now if white plays 34.Bxb7, he is completely lost after 34…Nxd4. He’s only down a pawn, but more importantly, he has no way to meet 35…Ne2+. The knight check will either win the unprotected rook on c4, or set up a checkmate on f1 after the king slides over to h1. Thus, Dean played 34.Ra4, but after 34…b6 35.Bd1 Nc3 36.g3 Nxd1 (not the only way, but visually more pleasing) 37.gxf4 Nb2, White’s rook is trapped on a4! Ippolito resigned, rather than play on down a whole piece with absolutely no hope. So with my 3rd win with the black pieces (in 4 games, as compared to 5 draws in 5 games as white! ), I finished with 6.0/9. As mentioned earlier, Finegold lost to Eugene and Robson drew with Rensch, so there was a 3-way tie for first with Finegold, Perelshteyn, and me. Perelshteyn won the trophy on mathematical tiebreaks. Finegold made his final GM norm while Rensch made his final IM norm – congrats to them both! Thanks also to Susan Polgar for organizing a fun, professionally done event. I recently competed in the SPICE Cup (Group B) in Lubbock, Texas. Hosted by Texas Tech University, it was a Category 11 round-robin (average rating 2503 FIDE). The top group was a Category 16 (average 2631 FIDE) double round-robin. As the 3rd lowest rated player in the event, I didn’t expect it to be an easy event, but unlike my previous event in Montreal, the players here were much more tightly bunched in terms of strength. The highest rated player in the group, IM Gabor Papp (2562 FIDE) of Hungary, was not so much higher rated than me, while the lowest rated player, FM Daniel Rensch (2386 FIDE), had beaten me two times in three previous encounters. Strangely enough, I had the position after 14 moves before, in 2006 against GM R.B. Ramesh. Somehow, though, Davorin missed this in his preparations and so he had already spent a good deal of time to get to the diagrammed position! 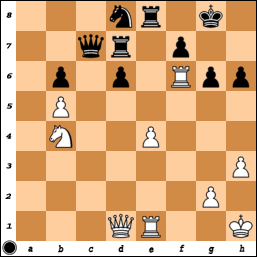 Anyways, Ramesh played 14…f6, which avoids the problem of 14…Nxc5 – namely that the knight capture walks into 15.Rfd1!. 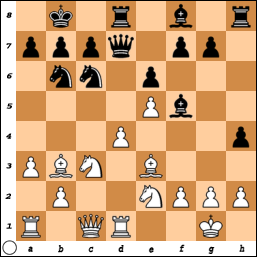 The d5-pawn is pinned (since capturing on c4 would lead to mate on d8), but after 15…Be6, White has 16.Qb2!. With the pin broken, the d5-pawn is again under attack, but now the g7-pawn is as well. 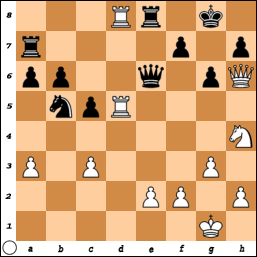 After a short think, Kuljasevic played 14…dxc4, which is a better move. After 15.Rfd1 0-0 16.Be7 Re8 17.Bd6 Nf6, I felt I was better, but I struggled to find a way to keep my advantage. On 18.Rac1, I decided that Black would likely play 18…b5 (if 18…Be6 19.Nd4 Bd5 20.Qb2 looks annoying, threatening both Nf5 and Nb5). 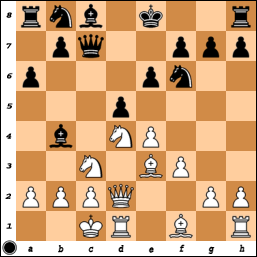 White would then like to play 19.a4, but without a rook on a1, Black can simply play 19…bxa4. In round 2, I was white against IM Ben Finegold (2513 FIDE). Ben has long been one of America’s strongest IMs, but he somehow has never managed to get the GM title. He surprised me in the opening, but my biggest mistake was thinking that I had the advantage (and so should press). In reality, I was worse, and I should have been playing for equality. By the time I realized what was up, I was already clearly worse, and soon found myself in the following position after 24…Bb4-e7!. Black is now threatening to take twice on g3, followed by …Bh4, pinning and winning the rook. White can’t easily defend the g3-pawn and pushing it to g4 isn’t an option because f4 becomes irremediably weak. Meanwhile, 25.f4 doesn’t help as after 25…Nf6, White can’t really guard the e4-pawn properly. The Queen is needed to guard the b5-knight; the b5-knight needs to stay put because the b3-knight is undefended behind it. In time pressure, I decided to play 25.Nd2. The idea is to guard the g3-pawn from f1. Finegold continued with his plan: 25…hxg3+ 26.hxg3 Nxg3 27.Rxg3 Bh4 28.Nf1 Nf4 29.Qc4! 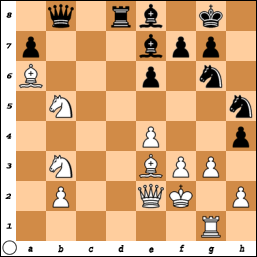 (not 29.Bxf4 Qxf4, and White can’t deal with the threat of …Rd2 later) Nh5 30.e5! (hitting the Bh4, so not giving Black time to calmly pick up the e5-pawn). After 30…Bxg3+ 31.Nxg3 Nxg3 32.Kxg3 Qxe5 33.Qf4, White has escaped the worse and I managed to draw the endgame after the queen exchange. 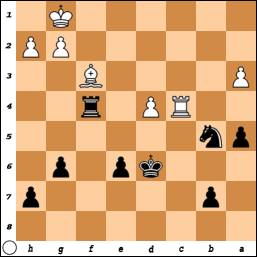 However, instead of 25…hxg3+, Black had the very strong 25…Rxd2!. The point is that on 26.Qxd2, Black gets two minor pieces for the rook with 26…Bxb5; meanwhile, after 26.Bxd2, Black has 26…Qb6+!, picking up the bishop on a6. It was this move that Ben missed. I saw this before playing the knight move, but as I didn’t see what else to do, I figured I might as well try. Luckily, it paid off. With two uninspiring draws from my first two games, I faced IM Ray Robson (2527 FIDE) as black in round 3. Ray is one of America’s most promising talents in a while, and he beat me in a very complicated game in July at the World Open (https://vbhat.wordpress.com/2009/07/12/taking-a-ride-on-the-reading-the-first-half-in-philly/). White controls more space across almost the entire board and has the bishop pair to boot. Among other things, he’s currently threatening 23.Bxg6 fxg6, when Black will never be able to really challenge White’s central dominance and will be stuck with rather weak kingside pawns. I played 22…Nf8, which isn’t particularly inspiring, but Black’s position is a bit tougher to crack than it looks like at first glance. For all his pluses, White has two problems – Black’s knight on g4 controls some nice squares around White’s king, and White’s central pawns, if they can’t make any threats, can quickly become weak if Black puts pressure on the d-file. Ray decided to solve this by going after the knight on g4 (and the pawn on h5), but landed himself in some trouble. After 23.Bf5 Qb6 24.Kg2 Rbd8 25.Nh2 Nxh2 26.Kxh2 c4 27.Be3 Qb7, I was threatening to take on e5 and then d5. 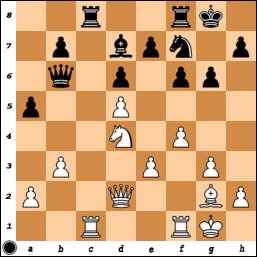 Thus, Ray played 28.e6, and after 28…Bf6 29.axb5 Qxb5 30.Qxh5 Re7 31.Re2, we reached the following position. Black is now down a pawn and it looks like White is in charge, but unlike the previous diagram where Black was retreating, Black now has an opportunity to move forward. After defending for a while, I didn’t need a second invitation. 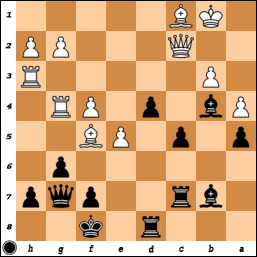 Black’s pawns are rolling, so Ray found the only way to make things interesting with 39.Be3!. By this point, by the way, we were both in horrible time pressure. With no second time control, all we could rely on was the 30-second increment. Thus, intuition has to take over, as the position is still rather complicated and you don’t have time to calculate everything. I immediately played 39…Qxe3 40.Bh7+ Nxh7 41.Rxe3 d2, but after 42.Qc5, I had to think a little bit. I have two minor pieces for the queen, but with my d- and c-pawns, I felt my position had to be winning when I gave up my queen. Still, it’s not trivial. 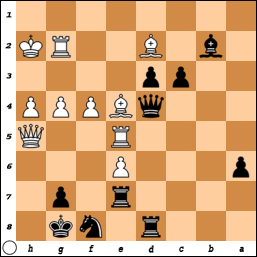 For example, 42…Ree8 43.e7 Rd7 would lose to 44.Qc4+! 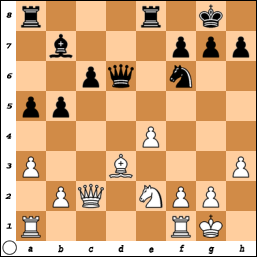 Kh8 45.Qf7!, and White’s threats carry the day. Similarly, 42…Kf8 also loses, this time to 43.Rd3!! 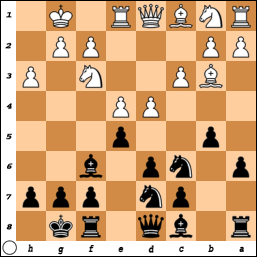 Rxd3 44.Qc8+ Re8 45.e7+ Kf7 (not 45…Kxe7 46.Re2+) 46.Qc4+ and after 47.Qxd3, Black’s pawns are frozen. With that in mind, I played 42…Rxe6!, and after 43.Rxe6 d1/Q 44.g5 (trying to restrict Black’s knight on h7) Nf8 45.Re7, I found 45…Qh5. White’s h4-pawn is surprisingly weak, and moving the king up to the 3rd rank entails allowing Black to play …Ng6, hitting the pawn again. Thus, Ray tried 46.Qc4+ Kh8 47.f5, but at this point, I took advantage of some nice chess geometry to play 47…c2!. The pawn is going to queen, but if White plays 48.Rxc2, then 48…Rd4 wins the h4-pawn and White is not going to survive that attack. Ray tried 48.f6, but after 48…c1/Q (double promotion!) 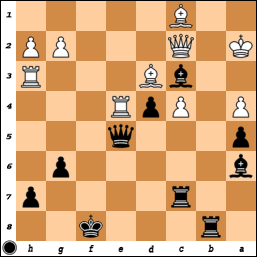 49.fxg7+, Black has 49…Bxg7!. The end was 50.Qxc1 Qxh4+ 51.Kg1 Bd4+ 52.Kf1 Qh1+, and White is going to lose his queen, so Ray resigned. White’s position looks dominating, but how does he make progress. My original plan was to play 25.Nf5 here, but while 25…gxf5 loses after 26.Qg5+ Kf8 27.Rxe8+ Qxe8 28.Rd8, 25…f6 was a considerably tougher nut to crack over the board. I looked at all sorts of variations for close to half an hour before deciding that nothing was particularly clear. I then spent another chunk of time to find something else to do, and decided on 25.c4. It’s a rather tricky move, but sadly, not the right one. After something like 25…Nc3 26.R5d6 Qxe2, White has the amazing 27.Qd2!! which wins a piece! Other moves similarly lose after 26.R5d6. White also gets the advantage after two other natural replies by Black: 25…Ra8 26.Rxa8 Rxa8 27.Nf3! is good for White, while 25…Nd4 26.e3! is also pleasant. Papp admitted after the game that he didn’t see what was wrong with 25…Nc3, but that after my 40 minute think, he figured I had found something. Buying the act, he decided to play the correct 25…Nc7!. After 26.R5d6, he again reached correctly with 26…Qxe2 27.R8d7 Qxc4!. Black needs to break the pin on the c7-knight, so he needs to free the b5-square for the knight. He also threatens Re1+ and Qf1+ himself, so I played 28.Nf3. After 28…Nb5, though, I had no choice but to go for a repetition with 29.Ng5 Re1+ 30.Kg2 Qf1+ 31.Kf3 Qe2+ 32.Kg2 and the game was agreed drawn shortly. 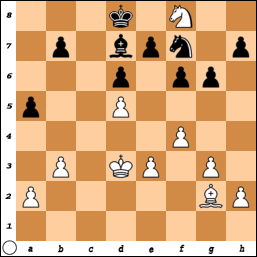 Back in that diagram, though, White did have a win with 25.Nf5 – after 25.Nf5 f6 26.Rxe8+ Qxe8 27.Qd2! Ra8 28.Nh6+ Kh8 29.a4!, White is winning. 29.Rd7 would have failed to 29…Nd4! 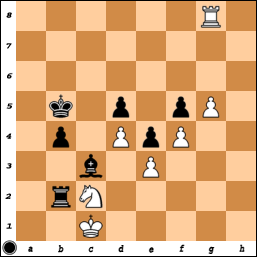 !, but by kicking the knight away first, White’s rook and queen invade with decisive impact. So with a few ups and downs, I found myself with 2.5/4. At the time, GM Perelshteyn was leading with 3.0/4, along with IMs Finegold and Antal.